Listen close, gaze out, and lose yourself to the moment. 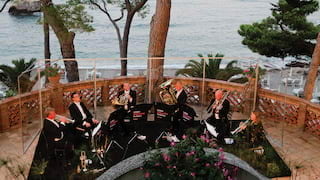 We have teamed up with London Philharmonic Orchestra to offer exclusive concerts at breathtaking Belmond destinations worldwide. Masters of the art of once-in-a-lifetime travel experiences, Belmond have arranged a series of musical events in Sicily, Brazil and Africa. Whether you’re a classical music connoisseur or simply looking for a completely unique events, timeless memories are guaranteed. Set off on a six-night adventure with Belmond Safaris in Botswana. Stay at our two newly-designed lodges, Belmond Eagle Island Lodge and Belmond Savute Elephant Lodge, and anticipate an unforgettable evening of melodic magic. Beneath the endless starry skies of the Okavango Delta, musicians will perform an intimate concert including an arrangement of Saint-Saëns’ Carnival of the Animals. It’s a very special piece that truly reflects the wild, untamed spirit of the setting. Anticipate a musical extravaganza at Belmond Hotel das Cataratas against the backdrop of the Iguassu Falls. The concert begins when the park is closed to ordinary visitors. Begin with a sunset cocktail reception, followed by a special dinner in Itaipu Restaurant. Musicians bring to life the works of Brazilian composer Heitor Villa-Lobos, who blends European tradition with Brazil’s folk influences. A special pre-concert performance with a smaller group of London Philharmonic Musicians is offered exclusively for those booking a suite. Priced begin at R$2,279 per night, based on a two-night stay in a Junior Suite with falls view. Let your heart soar in Taormina. Musicians bring to life Vicenzo Bellini’s best-loved aria from the Sicilian’s greatest opera, Norma. Listen at Belmond Villa Sant'Andrea on 3 September, surrounded by the sweeping blue of Mazzaro Bay. 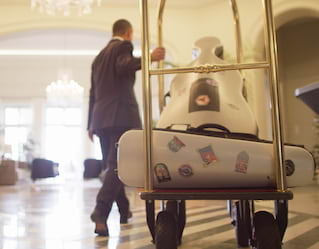 Or enjoy a performance on 4 September at Belmond Grand Hotel Timeo, boasting panoramic views of Mount Etna. Both evenings open with Rose Without a Thorn Suite, said to be a musical love letter from Henry VIII to Catherine Howard. They close with works of Italian masters to end the evening in classic Dolce Vita style. The first in our 'Exceptional Music in Exceptional Locations' series was held on the magical island of Madeira. Find out more about the enchanting experience.